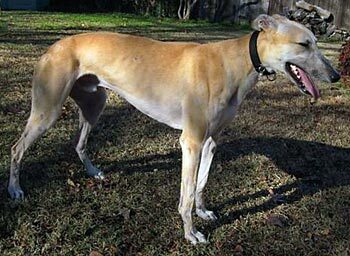 Sneaker, aka NST Sneak a Peek, is a 2-year-old red fawn male born November 11, 2007. His sire is WW Apple Jax and his dam is NST Hazel. Sneaker was turned into the Ft. Worth Animal Control as a stray. When he arrived, his skin and coat were laden with sores and thinning hair from a fungal infection. It took 3 months for all to clear up, and Mr. Sneaker is finally completed with all his medical procedures! His hair is filling in daily, growing and growing, as healthy as can be! Sneaker is cat and small animal tolerant. Sneaker has been on a long journey - from wandering the streets, lonely, hungry and sick, to being in a warm home with plenty to eat, as well as treats, toys, and love. He has conquered parasites, Rocky Mountain Spotted fever, and ringworm - all in two short years of life. Sneaker has chosen to forget his past and get on joyously with the present. He loves his meals, devours snacks, relishes treats and good things to chew on. 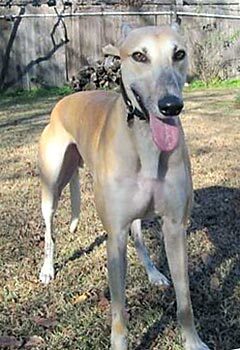 Although he may have missed his puppy play years, he now jubilantly tosses toys around outdoors, runs after toys thrown for him, and bounds after his greyhound sisters. He is a confident boy when he is in the relative safety of his own backyard. 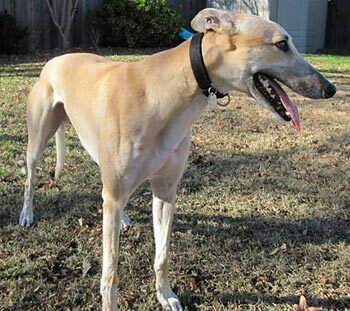 Sneaker is among the most devoted greyhounds you might ever meet. While he is still nervous about many new things, he attaches himself to one person at first and then will gradually expand his trust to others around him. He is best buddies with his trusted human, coming when called, even in the midst of playing and running. Sneaker is still a little nervous about walks, although he's improving daily. Nevertheless, he's exuberant about getting his leash on when it is time to go for a walk and while out on walks is happy to let strangers show him love and attention. Sneaker rides well in the car and is very durable on long rides and long walks. He still has to learn a good "wait" command for leaving the car. He definitely wants to be the first one out of the car and the first one back in the house after walks. He has, however, really mastered a good wait command when coming in from outdoor play or potty breaks. He will now wait for his person to enter first, or even a greyhound foster sibling, before barreling through. He waits for his dinner and to get his leash on too. Sneaker has a gorgeous black muzzle on his fawn face, and exotically black-lined eyes made all the more striking by black markings above his eyes. His curly tail has some black stripes. It is only Sneaker's shyness that is keeping him off the opera stage. He's never as happy as when he is singing with piano accompaniment or in a duet with his people. However, his stage fright prevents him from showing off his operatic talent - really! He refuses to sing in front of other people. It is very hard to keep from laughing, however, when Sneaker is singing with you. Not only has Sneaker found joy in his life, but he will fill yours with joy as you sing along with him and watch him gain his confidence. 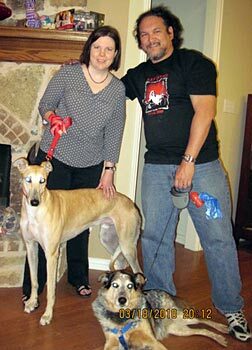 Sneaker with his new family!